While meeting to prepare my taxes, my accountant asked me, "What's new and good in your line of work?" She knows that I am a long time interfaith educator and that in the last few years I have been working in coalitions with members of other faith communities to combat religious prejudice against Muslims in this country. Despite much to deplore and enormous challenges ahead, I could answer that there is some good news about Islamophobia. Obviously, the good news needs to be heard in the context of the bad news, bad both for Muslims and for the rest of us who care about America. Recent reports by the Pew Research Center (August), the Center for American Progress (August) and the Brookings Institution and the Public Religion Research institute (September) all document the bad news. More than half of all Muslims under the age of 30 report being the victims of religious intolerance in the last year (Pew). In the last decade, seven foundations have poured more than $40 million into efforts to drum up fear of Muslims in America (CAP). Forty-seven percent of Americans believe Islam is incompatible with American values (Brookings). 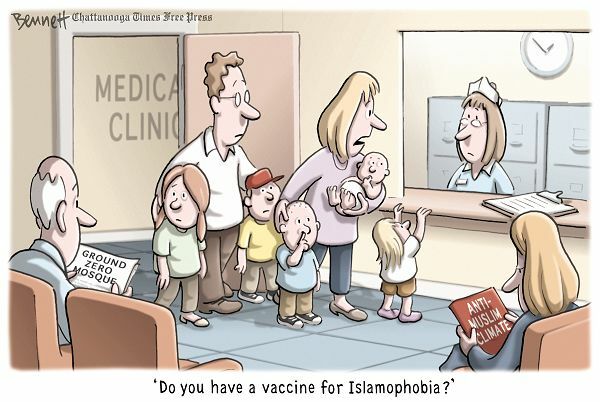 Clearly, religious prejudice against Muslims continues to be a concern -- a serious concern. At the same time, each report also includes the seeds of some good news. First, the Brookings study, "What It Means to be an American: Attitudes in an Increasingly Diverse America Ten Years after 9/11," reveals that most Americans have very little direct experience of Muslims. The majority have no opportunity to speak to a Muslim, even occasionally. What's good about that? In fact, it helps explain findings such as the Gallup Poll that placed Muslims as the most disliked religious group in America. We tend to dislike what we do not know. Robert Putnam describes the opposite situation as the "Aunt Susan effect." In his book "American Grace," Putnam observes how positive feelings develop as people get to know the "other" as friends and eventually family members. With the exception of African American Muslims, Muslims are part of a recent immigrant community. The Pew study, "Muslim Americans: No Sign of Growth in Alienation or Extremism," reports that 63 percent of Muslim Americans are first-generation immigrants to the U.S., with 45 percent having arrived since 1990. (Strikingly, 81 percent of Muslim Americans are citizens of the U.S., including 70 percent of those born outside the U.S., a higher percentage than most other immigrant groups.) Muslims simply have not had the time to integrate into American society, but there is evidence, also in that study, that the process is well under way. The Brookings report broke down responses by age of the informants. Americans ages 18-29 were twice as likely as those ages 65 and older to know Muslims personally. In each category, the young are moving in the direction Robert Putnam would predict will lead to better news. The future looks more promising than the past. Second, most Americans do not know much about Islam. Once again, this can be the good news. In the Brookings study, people were asked how much they believe they know about Islam. Fourteen percent said they know a lot about the religious beliefs and practices of Muslims, 57 percent said they know a little, and 29 percent said they know nothing at all. The group that was most likely to say they know a lot about Muslims was, interestingly, Americans who identify with the Tea Party movement (21 percent). What they know, unfortunately, was provided by a small cadre of well funded scholars, bloggers and media personalities, in particular, those on Fox News. The Center for American Progress recently documented the effort to shape the perception of Americans about Islam through an "echo chamber" of recycled information and misinformation. "Fear, Inc.: The Roots of the Islamophobia Network in America," shows how movements like the one to ban so-called "Sharia law" are created. A "solution in search of a problem," state legislation proposing to keep Islamic law from superseding American law did not emerge out of spontaneous grassroots concern. In fact, according to a recent article in the New York Times, one of the chief authors of this legislation confessed that "if this law passed in every state it would not have served its purpose." The purpose is to stir up suspicion and controversy, not to actually pass legislation that the author himself knows is unconstitutional as well as unnecessary. As people learn more about the work of this small group and their funders, we will be in a better position to offer a counter narrative. The good news lies in the more than 80 percent of Americans who know little or nothing about Islam and know that they know little or nothing about it. Americans are evenly divided over the question of whether Islam and democracy are congenial, but the question is flawed. It presumes a static entity called "Islam." Like other great religious traditions, Islam is evolving and multidimensional. Neither Roman Catholicism nor Judaism were, in essence, "democratic," but American versions of both of those traditions became part of the fabric of American religious life, as will American Islam. Again, this has already begun to happen. This brings us to the third piece of good news, the outpouring of support for Muslims by their sisters and brothers in other religious communities in America. On Sept. 8, I stood proudly, shoulder-to-shoulder, with representatives of 26 national religious organizations, organized by the Islamic Society of North America. We said we refused to allow our communities to be victims of campaigns of misinformation. We can also use the Internet. Around the country, people commemorated 9/11 with formal programs and through simple acts of friendship. Could I tell a darker story today? Of course. Should we be complacent? Far from it. The bad news is that there are people waking up early in the morning to take advantage of Americans' ignorance about Islam and to fill the void with fear. The good news is that others are determined to wake up earlier still and help Americans live the best of our country's values.